As a third generation nurseryman, Wes Fleming was ‘born and bred’ growing trees. As an eager 11 year-old Wes started growing trees and selling them back to the nursery – showing his entrepreneurial and business savvy at an early age. Today Wes is dedicated to delivering the best wholesale trees in Australia, and to introducing new and improved cultivars from overseas. Originally a bare-root tree production nursery, growing millions of trees for the orchard and retail sectors, Fleming’s relied on the majority of sales during winter. In the 1990’s Wes identified the emerging opportunity for year-round sales of ready-potted trees. 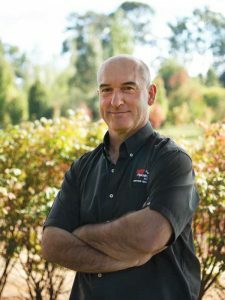 A highly motivated personality with a big picture attitude, Wes has encouraged and implemented many significant changes including the establishment of Fleming’s small containers, advanced tree and native nurseries. In the early 2000’s he started to develop a landscape division with the establishment of ‘Habittude’ – a supply, install and maintenance program for the urban development industry. That division has now grown to include commercial and domestic landscape services such as design, construction and project management. Having earned a widespread reputation for quality and innovation in horticulture, Wes now finds himself in a position to give something back to the industry. Wes was the driving force behind the creation of the Australian Street Tree Evaluation Program (AUSTEP) in 2001, and is a sponsor of both the Australian Institute of Landscape Architects (AILA) and Parks & Leisure Australia (PLA), and a member of the Urban Development Institute of Australia (UDIA Vic). In 2004, Wes’ vision to further unite and place the horticulture industry on the world stage was realised with the first ever Australian show garden to be exhibited at the renowned Chelsea Flower Show in London. Eight more trips to Chelsea were to follow bringing much needed ‘good news’ to the landscape and gardening industries culminating in the 2013 BEST IN SHOW award with designer Phillip Johnson. In 2015 Wes Fleming was awarded a prestigious Order of Australia Medal for his contributions to horticulture and landscape architecture. When not involved in horticultural pursuits, Wes and his wife Paige enjoy spending time with their family including elder children Jess, Jake, Todd and younger siblings Aurelia and Mietta, as well as other interests including a close association with the Essendon Football Club and thoroughbred horse breeding & racing, and travel.